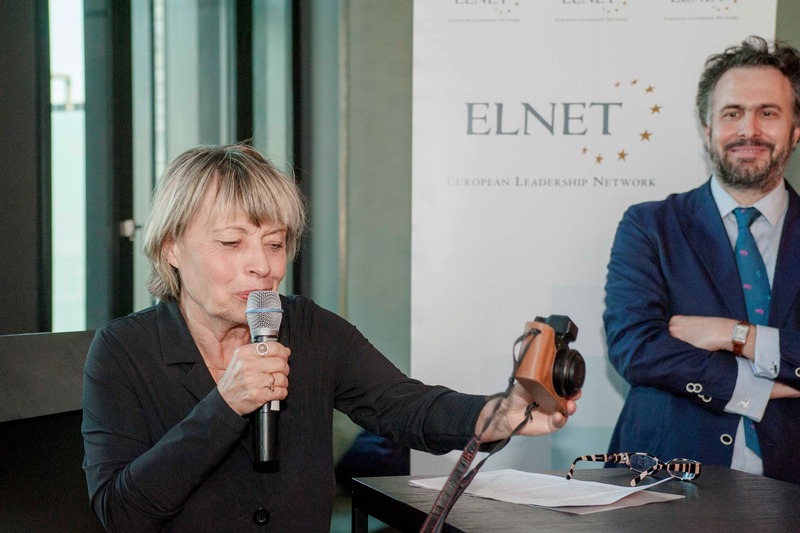 On 14th May 2018 ELNET-Germany celebrated the 70th anniversary of the State of Israel in Berlin. For the third time ELNET-Germany organized an event in Berlin on the occasion of Israel’s Independence Day. On a very complex day, dominated by news from Gaza, the focus was to celebrate Israel’s round birthday with and to honor the work of one of the most important press journalists of Israel, David Rubinger. ELNET-Germany personally met him during a delegation in 2016 – shortly before his death in March 2017. The pictures of Rubinger stand for the long story of Israel. He chronicled the Israeli history from its birth of a modern state, its leaders, its triumphs, its tragedies and its people. He joined many military operations, peace talks and was well-known all over the country and beyond. He worked for “Time Magazine” and was awarded the Israel Prize, his country’s highest honor. The pictures of David Rubinger were a generous private lend by Gisela Kayser, who serves as Chairwoman of the NGO “Friends of the Willy-Brandt-House”, and was a close friend of the photographer. ELNET partnered also with the Twin Wineries Initiative. This initiative brings together German and Israeli wineries. Initiated in 2008 by Renée Salzman, today more than 20 wineries from Germany and Israel regularly meet and exchange their ideas and foster the relationship between Germany and Israel. In a loose and relaxed atmosphere with German and Israeli wines from the Israeli Twin Wineries Initiative, the event attracted about 200 guests from politics, society, Jewish community, political think tanks and foundations, media, science or culture. Among the guests, more than 20 parliamentarians from different parties of the German Bundestag were present. Also, members of federal and state governments such as Parliamentary State Secretaries, diplomats from the Israeli Embassy and young political leaders working in the German Bundestag or the Ministries. The event took place in the APARTMENT BAR at the AMANO Grand Central Hotel. Daniele Nati, Executive Director, ELNET-Germany with MP Anja Weisgerber (CSU), MP Stephan Pilsinger (CSU) and MP Silke Launert (CSU). Stephan Mayer (CSU), Parliamentary State Secretary, Ministry of the Interior with Janika Bratvogel, Deputy Director, ELNET-Germany. Guests enjoying the evening. On the right Tom Franz, famous German chef in Israel.